News Alert ~ Congratulations Pho2U! Pho2u! 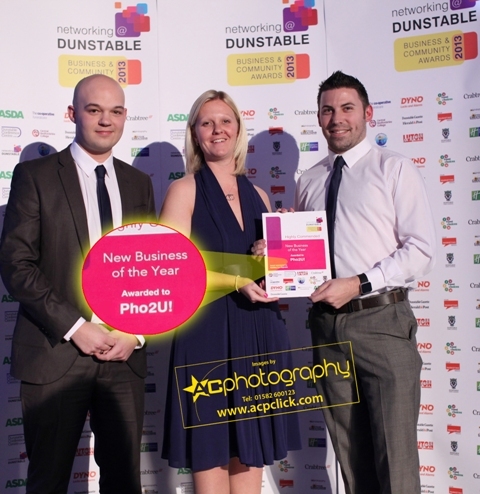 based in Dunstable, Bedfordshire are both pleased and excited to announce their recent success at the Dunstable Business Awards, winning the coveted title of Highly Commended – Business of the Year 2013. The judging panel comprising of eminent local public figures and prominent business members, took the decision to bestow the accolade on the business despite it still only being in its second year. Pho2u! the brainchild of Lewis Duncan was founded in December 2011 after deciding that photography was not just a passion but a viable business. At the heart of Pho2u! ethos is affordable photography for everyone, from local families looking to capture that “moment in time” to businesses requiring product shots. From a new start up business in 2011 Pho2u! has gone from strength to strength, making quite a name for themselves in the local area being the first port of call to business such as The Old Palace Lodge, Dunstable Cake House and finding themselves the official photographers for the Mayor of Dunstable. In their first year of business they had not only reached their target to run at profit but had exceeded their personal expectations by capturing 17 weddings and 14 home photo shoots. Shortly after Pho2u! first birthday, Lewis quickly realised that the business had grown and Pho2u! had already employed 4 sub-contracted photographers, booked in excess of 63 weddings and in recent weeks taken the keys to a large photographic studio in Abbots Langley. Heading into their third year, Pho2u! have big plans including fun, informal workshops, whilst maintaining and forging relationships with existing clients. From a company who in just two years has gone from start up to a high street studio and accruing a list of awards including Wedding Experts 2013 and the above mentioned Highly Commended – Business of the Year 2013, they are definitely a company to watch. The founder of Pho2u! Lewis Duncan has studied photography since GCSE, gaining Distinctions in a National Diploma at college. Lewis views photography as a constant learning curve and enjoys learning new and different techniques. He has a personal love of capturing landscape and architecture, however since becoming a father has developed a passion for capturing families especially in a non-formal setting when all members are relaxed and natural. Exclusive Special Offer: 10% Off Wedding Photography when you mention Ice The Cake.